This year marks the 11th graduation of students from the Motorcycle and Power sports Program. The program was designed based on an Industry Survey that asked employers what skills a technician would need to be successful in the power sports business. The survey told us that a varied background in all aspects from Small Engines, Snowmobiles, Personal Watercraft and Motorcycles was required. The program was designed with all these subjects in place. What also would be required was support from the manufacturers in the form of technical information as well as current units for the students to work/learn on. They came through in spades! Our labs are known affectionately as “Toyland”. Our program is the only one of its kind in Ontario. Graduates of the program are employed at Cycle Salvage yards, Multi-Line Dealerships as well as in Manufacturers Service Departments. Our Program recently held a Skills Competition. 28 students attempted the theory portion, with 12 students moving on to the hands-on portion in our Lab. There were four components to the lab, Parts Identification, Precision Measuring, Electrical Circuits as well as an On the Bike Diagnosis. The scores were fairly close with the winner being Ben Swanson. Ted Devries and Peter Chlorakos rounded out the top three. 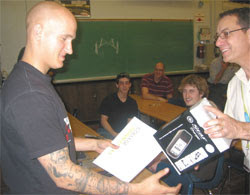 Prizes for the Competition were supplied by Yamaha Motor Canada, Snap-On Tools and Matco Tools Barrie. A total of $ 1700 in prizes was donated! Job Opportunities for our graduates are coming in from Sudbury, North Bay, Bradford, Newmarket, Fort MacMurray AB, as well as the GTA. Visit us to find more college programs, college courses about Toronto degree.